Luxury Cars, Hire Limousine, Hire Laxury Cars, Luxury Cars Booking, Luxury Cars Rental, Hire Limousine Mercedes Benz S Class , Mercedes Benz E Class, Mercedez Benz Sprinter, BMW 7 Series, Toyota Camry, Toyota Corolla, Chevrolet Optra. – NWTlimoint.com. 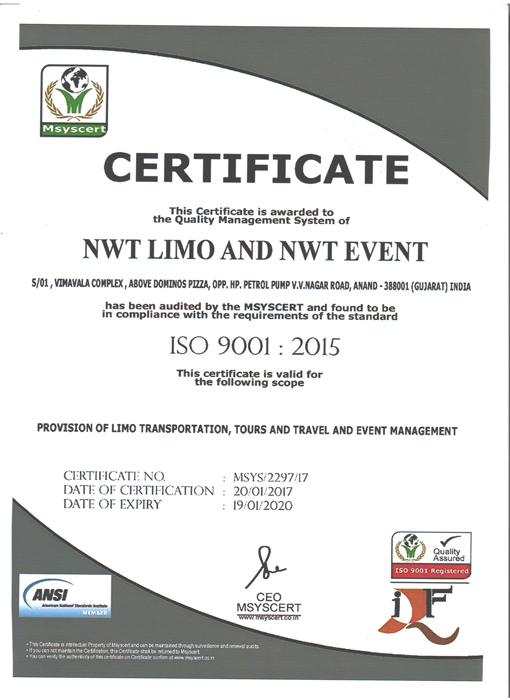 NWT Limo has its headquarters in Ahmedabad, India and specializes in luxury car rentals. Whether you are looking for a Mercedes, Jaguar, Range Rover, BMW, Porsche, Cadillac, Rolls Royce, Bentley, Ferrari, Lamborghini, Maserati, Corvette, Hummer, Viper, a conversion van, 15 passenger vans, a new hybrid, or a decked out SUV, you have come to the right place. We carry only the newest models available and keep our rental cars in pristine condition all with low mileage. A luxury vehicle sedan car, Limousine is driven by a chauffeur. It is a symbol of pride of the rich strata of the society. This Limousine is ideal for weddings, parties and sightseeing-tours. The main features are luxuries, safety and security features such as armoring and bulletproof glass. A royal ride on the luxury sedan Limousine can be felt by the luxury car enthusiasts only. If you have a nose for luxury, then enjoy a ride on the giant Limousine. Travel like a royal personality or a king. Mercedes Benz is a large car with all the modern facilities in it. The manufacturing company of this car is Mercedes, Germany. The engine capacity of this car is 2295 CC. The seating capacity of Benz is of 5 people including driver. The most attractive feature of this new model is its twin oval headlamps that give it a very distinctive look. It is meant for those who want to travel in style in absolute comfort. The Mercedes is excellent in performance, drive ability and handling. Mercedes Benz is considered to be the most comfortable and luxury car. The key safety features of Mercedes Sprinter include the driver airbag, passenger air bags, yaw control, antilock brakes, and side airbags etc. The passenger van model of Dodge Sprinter has a maximum interior height of 6 ft. 1 inch while the cargo van trim features 270-degree rear opening doors with magnets. The Standard features of Mercedes Sprinter are air conditioning, power steering, AM/FM cassette player, and second passenger side sliding cargo doors.Â It comes with a bucket driver seat that has tilt adjustment which complements the drive on the Sprinter. A flamboyant luxury car, BMW7 series is a 4 door, 5 passenger luxury sedans. It looks great from outside, the interiors are cozy and it is driver friendly luxury car. Driving this car is just a fun to the car riders. The new rear seat entertainment system of this car is great. BMW7 series is the fifth generation flagship model which feature elegant style, driving dynamics and innovations in all aspects. It is a comfortable and cozy car with style and comfort. The interiors of the car are festooned with precision, excellence and elegance. The entertainment system of the car is the state-of-the-art. The audio system includes a four-zone automatic air conditioner, wind deflector, and spacious seats. Toyota Camry is thoughtfully designed and sets new benchmarks in the levels of precision and workmanship. Camry's computer fluid dynamics gives it the best-in-class aerodynamic performance, with a co-efficient of drag of just 0.28. This cuts down wind resistance, minimizes wind noise at high speeds and enhances fuel economy. The Camry's European-look interior maximizes style, space and comfort. The Camry delivers an all-new chassis package that you'll really notice. Designed for high levels of safety, ride, handling and low noise, the new chassis has increased body rigidity and lowered the centre of gravity, presenting a larger footprint on the road than ever before. Camry's suspension has also been substantially improved. Toyota Corolla provides its passenger an unparalleled experiences of driving and travelling. It is the excellant example of engineering precision and styled with famboyance. It has 1.8 litre DOHC VVT -i powered engine that give 125 ps staggering power. The VVT-i technology provides the car an extra smooth acceleration, it reduced emissions and fuel efficiency. It gives us advanced security features. The Global outstanding Assessment body provides the high integrity cabin that absorb impact energy, there are disk brakes in every wheels, they are ventilated in the front and solid in the rear that provides assured and smooth braking. There is anti lock braking system used in the car, There are collapsible steering column and the toughest side door impact beam that make it more safer than any other luxurious car. Chevrolet Optra is a perfect car and has everything that one can imagine-smart styling, spacious interiors, state-of-the art safety features, and superb engine. Every part of the Chevrolet Optra is designed to make you feel powerful. Its special leather wrapped steering wheel, gear knob and leather seats make sure that you're always in control. Chevrolet Optra's world-class safety features include high-tension steel safety frame, strategically located steel crash bars, front and rear crumple zones, collapsible steering, power steering, power windows with One Touch Down Driver side, central locking, cooled glove box, tilt steering, audio system, sunroof, dual airbags, rear child locks, front and rear fog lamps, sunglass holder and three-point safety belts for all 5 occupants.